Get into the zone for a game of numbers that bingo players can appreciate. Lotto Zone is a great alternative to bingo with glorious digits as your guide to riches. It is a simple, fast and an easy way to win one of the most popular international games in the world. The homepage is fairly basic in design and will not wow the first time visitor. It is definitely a site where players need to delve deeper ignite the excitement. The Lotto Zone offers lotto gaming that is well known and played on a global level. The advantage to lotto type games is the convenience and ease of playing. With the introduction of online availability players no longer have to leave their homes to purchase tickets at a local market. Founded in 2009, the Lotto Zone team has developed an enjoyable site with special attention devoted to commitment of quality online gaming. They offer a wide assortment of gaming that extends beyond lotto games for a full range of entertainment. Powered by Progress Play software, they are instrumental in launching a dynamic line of products including Instant Games and a full line of Casino games. Lotto Zone is licensed and regulated by the Kahnawake Gaming Commission. The winnings on Lotto cards reach a staggering top prize of £100,000 with some games offering £300,000 depending on the players bet. Lotto games are classified into three styles. Classic Lotto is played by choosing 2 – 6 numbers on a card with various sets of number ranges to choose from. It’s important to know that the least numbers chosen will create bigger jackpot wins but the odds are much slimmer than choosing 6 numbers with a smaller cash prize. The Advanced Play allows players to choose either even or odd numbers or a specific range of numbers. The odds are much shorter and in players favor with 1:3 odds and a 1:2 odds on even/odd numbers. Pick Lotto is has 0-9 number range with up to 4 numbers that can be chosen. The more matches the higher the win. Players have betting options including Straight, Box, and Straight Box and will affect the prize amount depending on the selection. Casino Games are broken down into four sections including Table Games, Slots, Jackpots and Casual Games that consist of fun animated Scratch Card themes. Lotto Zone treats the player right from the very moment they sign up with a nice No Deposit Bonus and a welcoming Deposit Bonus. The Weekly Surprise promotion will randomly award players every week with thousands of dollars in bonuses. What day, what time is a surprise and a lucky players will see their players account with free bonuses. Weekend Offers are available including promotions for Slots, Casino Games and Lotto Cards. Enroll in the Subscription promotion and be rewarded with every 10th lotto card free. The Lotto Zone VIP Club will pamper players with lucrative rewards. Earn points while placing wagers on your favorite lottery and casino games. Points accumulated will determine the VIP status starting with Bronze, Silver, Gold, Platinum and Diamond. As you move up the rank in status the rewards increase with bonuses, conversion of VIP points to cash, Birthday presents, Personal Account manager and much more. Lottery gaming is a refreshingly unique experience from other main stream games. The Jackpots are impressive and the promotional offers kept current with tempting incentives. We rate Lotto Zone with 3.75 pink hearts. I was really surprised when I first joined this site. I wasn’t really sure what to expect but I knew that I was looking for something a little different. If you’re into lottery games, this is a great site for you. There are three different types of lotto games at the site: classic, advanced play and pick lotto. Plus, every week they give away thousands of dollars in bonuses. It’s totally random and could happen on any day of the week at any given hour and you won’t know if you’ve won until you see your account balance has miraculously become much bigger. Although I haven’t won, it definitely keeps things exciting and you never know if you could be the next big winner! They have much more than just lottery games too! In addition to these unique games, players can also take part in a selection of more traditional games, like slots, table games and scratch cards. Although you might think otherwise, this is not only a Lotto site, and you have Scratch cards, Slots and even the casino games. On the other hand, you can find 32 different lottery games, and this is probably one of the best lotto sites I have ever played. What I didn't really like is the download only software, but it is a Microgaming site. There is a special mobile site version, and you can access it from any mobile device like tablet or smartphone. I was expecting a little better starting bonus then a 100% bonus up to $200. There is no Bingo in here, and that is my only complaint. I did however spend some time playing the Slots, and won quite a few times actually. I was wondering how will the withdrawal go, and everything went really well and fast, in under a few days, no questions asked. This is definitely a unique site. They have a lot of new and interesting things to look out for. I found myself loving the layout here. It is very colorful and vibrant! 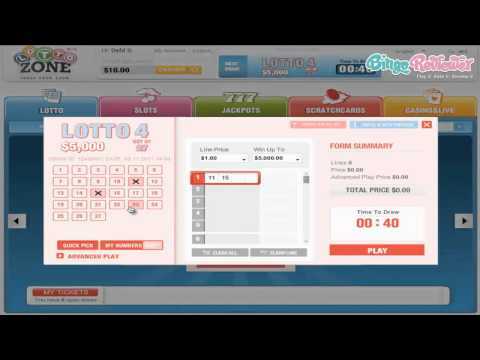 This is definitely a site for those who enjoy playing lotto games, but they do offer a variety of other games as well, making it the complete package. They have got all kinds of awesome promos to look out for. One of my favorites to take advantage of is the happy hour promo. It’s such a simple promo to benefit from. All you have to do is make your deposits during the designated happy hours and you can receive bonus cash back on your deposit. Another nice thing about playing here is that they offer a mobile version of the site! This makes it so easy to log on from your mobile device when the urge strikes and begin playing from anywhere at any time!